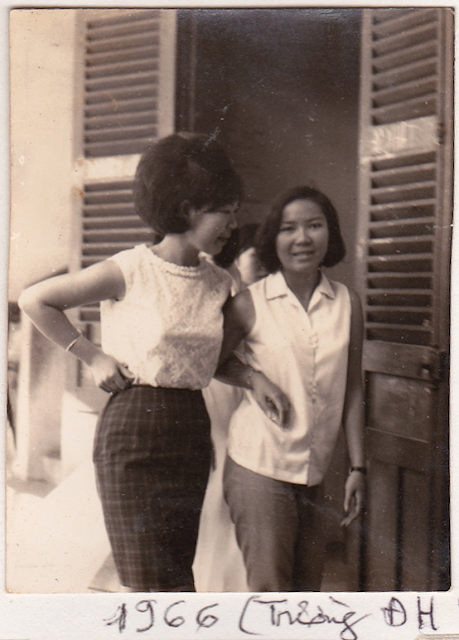 I found this photo of Mum Pham (left) with her bestie (right) at school back in 1966. The duo were separated by the Vietnam War and about 10 years ago reunited when her bestie migrated to Brisbane. The reunion was glorious. Mum would be 21 in this photo. I wore that same gold bracelet on her right wrist when I was about 20 (sadly, it died a tragic death when I got crushed at a music festival). It would be 15 years before Mum Pham would become a mother. She was pretty much carefree in 1966 and had no idea what lay ahead for her. Mum Pham studied to become a pharmacist and finished her degree, but never received her official documents because she refused to do a year of military service. She hated learning firearms let alone what that skill was intended for. No way she'd be willing to shoot someone if it came down to that. All her chemistry and biology studies didn't go to waste though. 13 years later when she fled to Germany with my cousins, and didn't have her 8 older siblings around to cook for her, she had to learn to cook. She was a late bloomer but, by gosh, the woman could cook. Mum Pham used to be able to taste a dish in a restaurant and recreate it at home on a Centrelink and Veterans Affairs budget. Mum could stretch a dollar in ways I still to this day can't figure out with all my access to computers, spreadsheets and calculations. It makes me sad that Mum Pham passed away just as us kids started coming good. Or maybe her falling ill is what drove us to work harder, be better and succeed. We can afford delicious home-cooked feasts on the regular, presents for occasions and fun Phamly outings that we never could when she was alive. This Mother's Day, The Phamly will burn incense for Mum Pham and celebrate Big Brother Pham's partner and mother of their 3 gorgeous children. By celebrate, I mean we'll feast. This year we'll be making lemongrass beef & vinegar poached beef rice paper rolls (tofu rice paper rolls for me) and eating until we are all uncomfortable in our own skin. Mum Pham would like that. Happy Mother's Day everyone - hope you spent it with family and loved ones.